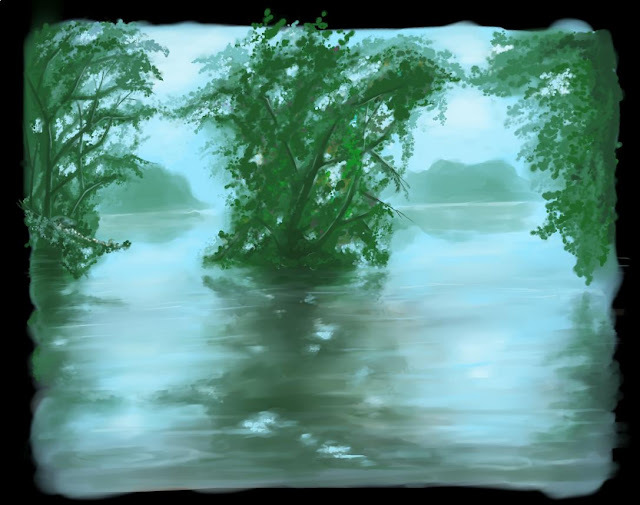 This tutorial is a little different from my other painting tutorials (list is [here]) in that it is using not only GIMP but the free open-source painting program [MyPaint] for much of the painting process. So this will be a mini-tutorial for using MyPaint as well. This is not a very difficult tutorial technically, the difficulties lie in the artistic work itself, not in juggling program controls or using "tricks" to get results. It is however highly recommended for you to use a graphics tablet for this, since MyPaint is designed to be used with one. With a mouse the tutorial is still doable, but it becomes a lot harder and probably not as satisfying. Nevertheless the technique for creating water is useful to know all in itself. No previous MyPaint knowledge is required. For GIMP parts it is assumed you have a decent understanding of the program. The [Beginning GIMP] and [Setting up GIMP for artistic work] tutorials might help you there, but any basic GIMP tutorials should do. 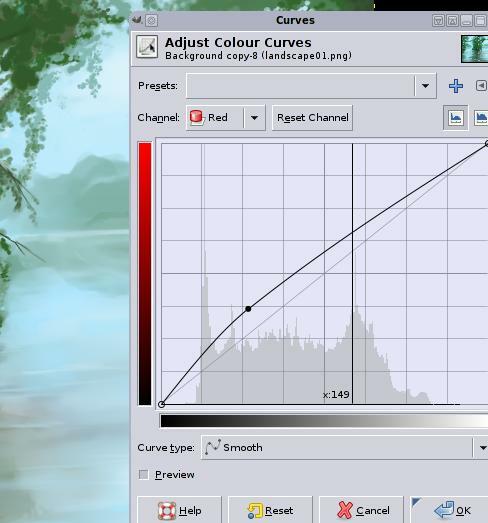 MyPaint is a free open-source paint program. 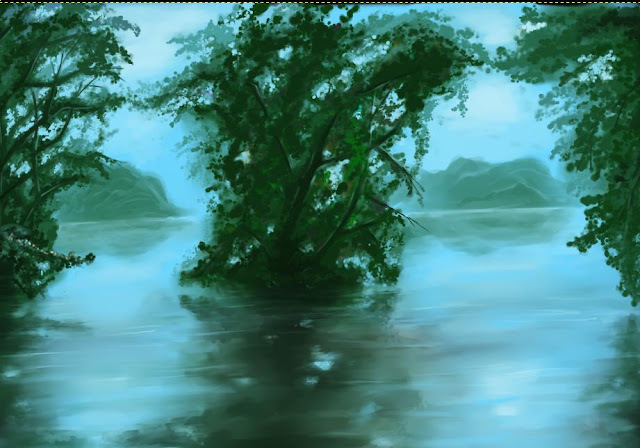 It is intended as a pure painting program and to be used together with GIMP since it has no photomanipulation or post-processing functions at all. MyPaint is meant to be used with a graphics tablet and you cannot get the full power of the program and its brushes without it. UPDATE: This tutorial was originally done at a time when Windows users where still stuck with the old MyPaint version 0.5 and were lacking many features. So in order to allow everyone to follow, it is not using any layers, backgrounds or similar features. These days MyPaint is in version 0.9+ and this stuff is available also for Windows users. Whereas screenshots are from MyPaint 0.6, I have tried to update some things to match later versions too. 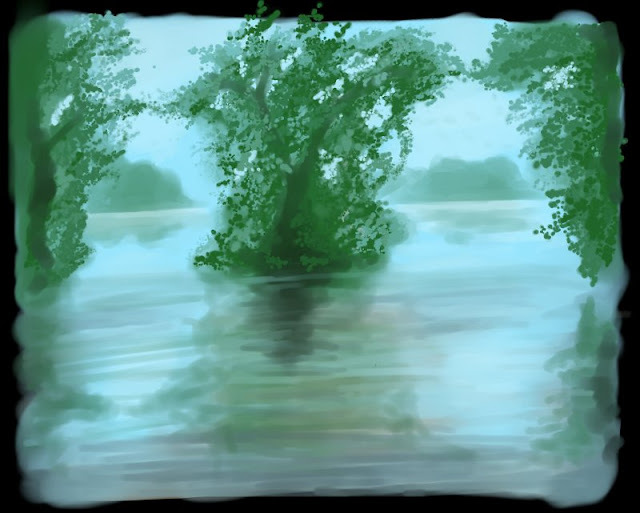 I have made a short review of MyPaint with plenty of images [here]. The program's official homepage is [here]. 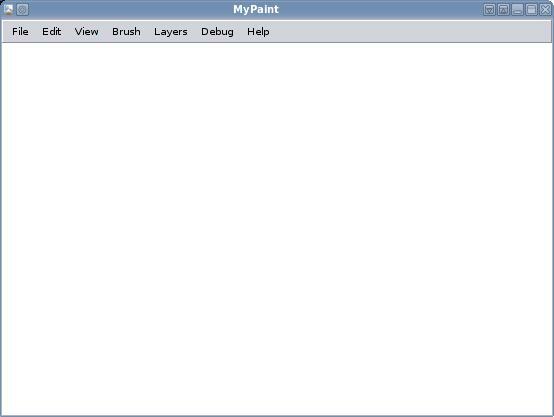 The MyPaint interface is minimalistic. You are not supposed to have any windows or tool options visible on screen more than necessary. The suggested work flow is to have one hand on your pen and the other one on the keyboard to do all operations. Pressing the correct keyboard key will temporarily bring up the selector you want, it then should go away as you continue to work. 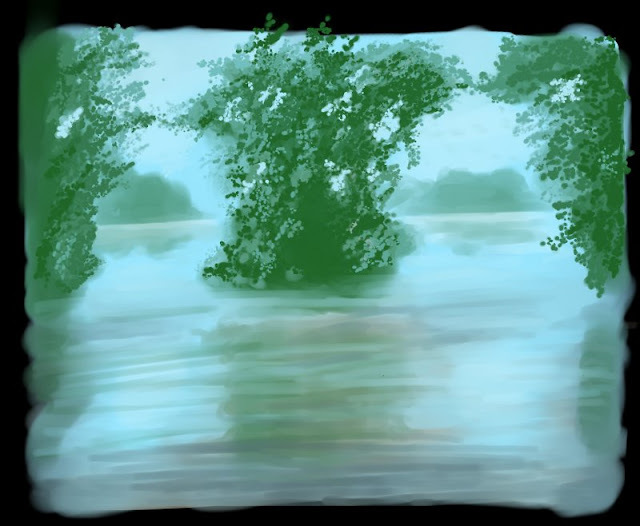 A brief explanation of this idea can be found in the [MyPaint official tutorial]. All keyboard shortcuts are easily changed: Just highlight the entry in the menu and press the new key combination you want (just like GIMP's dynamic shortcut feature). Left mouse button paints. The middle mouse button pans the canvas. F and D: Change the size of your current brush. G: Standard GTK Colour selector (click again to close). V : Pop-up colour selector (click again for second type, anywhere else to close). This is used to quickly select a colour close to your current one. B: Brush selector window. This is the core of MyPaint. All "tools" are implemented as different procedural brushes and with these a wide range of effects can be achieved. We will not go into modifying any of the default brushes in this tutorial, but the options to do so are nearly endless. R: Select the colour currently under the cursor (in 0.6, Ctrl-click can also be used). + and -: Zoom in and out. MyPaint has an unlimited canvas. In the 0.5 version zooming out too far will make the program slower though, so be careful. Ctrl+Z, Ctrl+Y: Undo / Redo. In 0.5 you have roughly 3 quick undos, after which the undo function becomes quite slow (it literally redraws every stroke you did). Version 0.6+ gives you some 20 quick undo levels. F11: Full-screen mode. You will want to use this as much as possible. Ctrl+S: Save your image. For the sake of this tutorial, save your work as an PNG image (since we are not using any layers). Save often. 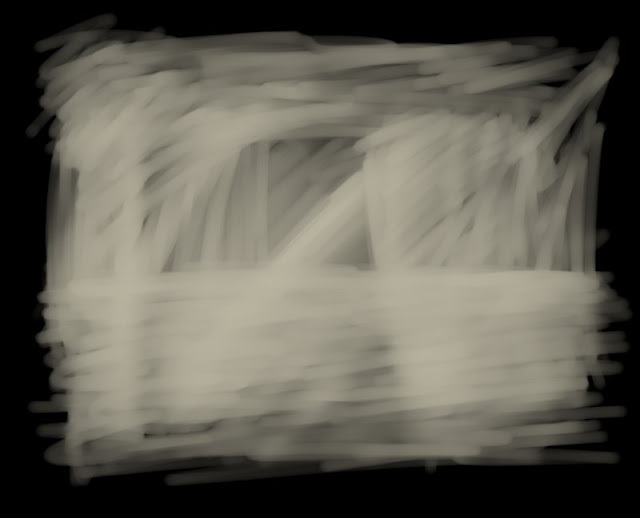 Open MyPaint and go to full-screen mode (F11) so you have the canvas filling your entire screen. MyPaint uses an infinite canvas, there are no edges. Avoid zooming or panning around for now. We will work in the area we see in our window. Select the menu Layers->Background and choose a black canvas. Press B to bring up the brush selector. Choose the "Blend+Paint" brush, still from the "Classical" brush categiry. 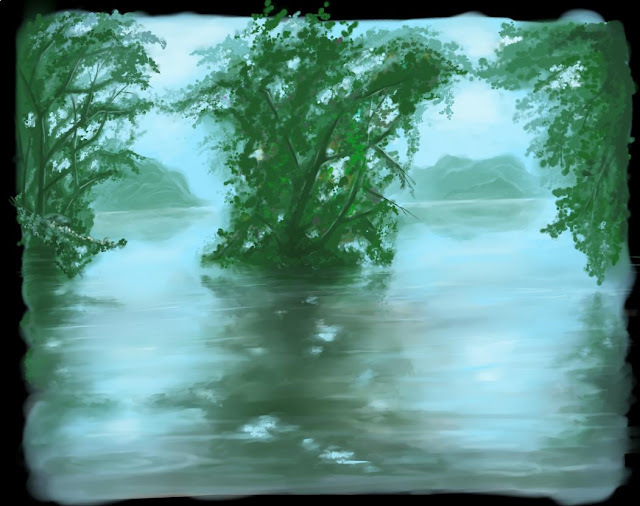 Our idea is to portray water separated by a few groups of trees. Calm water is however reflecting the sky, so we'd better start with that. Pick a bright blue and paint the sky. You can use a large (scaled up) paint+blur brush for this. As you see there is no worrying about being detailed at this point -- just scribble away! Lay out splotches of green in the center and towards the edges. 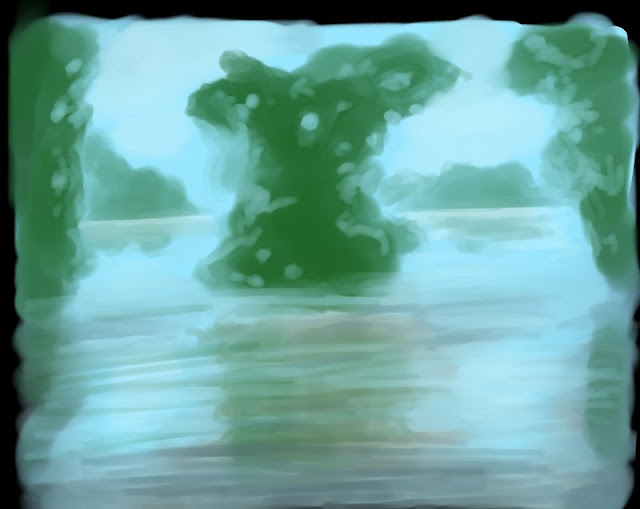 Also make sure you let the green stretch down from the actual trees -- this is their reflection in the water. Also pick a more faint green for the distant green shapes we see through the trees. They also reflect in the water. Remember to not paint things too thickly. Water is reflective and full of unexpected colours. By letting parts of the various colours shine through (by pressing down lightly) you get some of this for free. 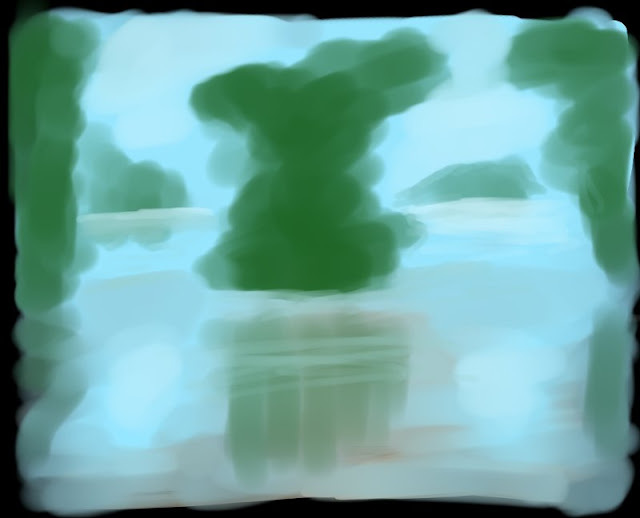 You now need to subtly smear the blue of the sky out into the green reflections to make the surface of the water. The Paint+Blend brush is excellent for for this since it does not create any hard edges. There is still no need to be too detailed yet. Step away from your monitor now and then to see the effect from a distance. The trees are not just blobs of green. Sky shines through them. 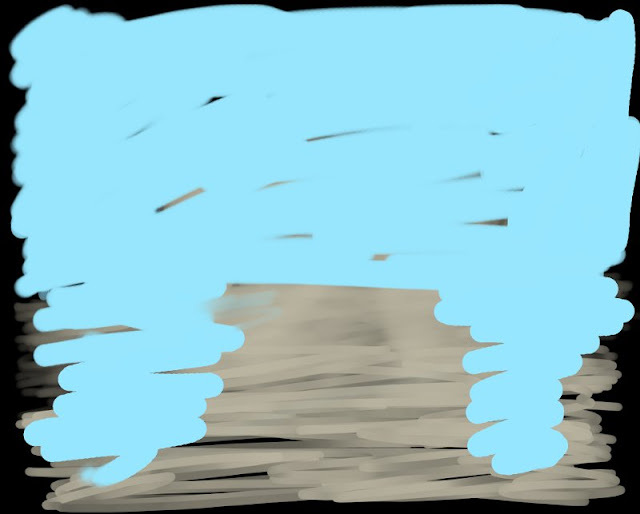 So pick the sky colour (R key) and dot in some "holes" in the trees. This is a tricky art and you will probably have to change these later. 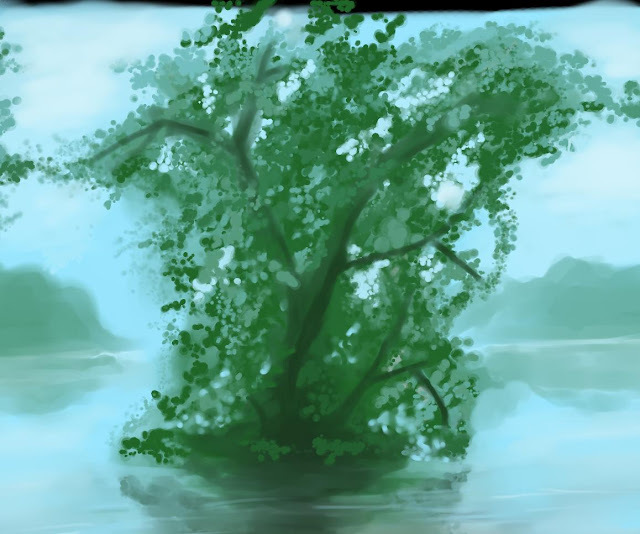 MyPaint helps us with making the trees more realistic. Look for a brush named "Course-bulk-3" and "Course-bulk-2". They don't look it but their effects do well to mimic leaves. The "Splatter" brushes in the "Tanda" brush set might also be useful for the same purpose. The further away the leaves are, the paler they will look against the sky. The paler, the more distant is the effect. So trace the outline of the trees with a pale green and gradually move closer by changing the colour to a darker green. In parts where you imagine light shines through, you can place some brighter "leaves". Note that we have not actually started forming the tree itself, we are just playing with shadows so far. Pick a dark green and start establishing a darker "core" of the trees. Let this darkness reflect into the water below. 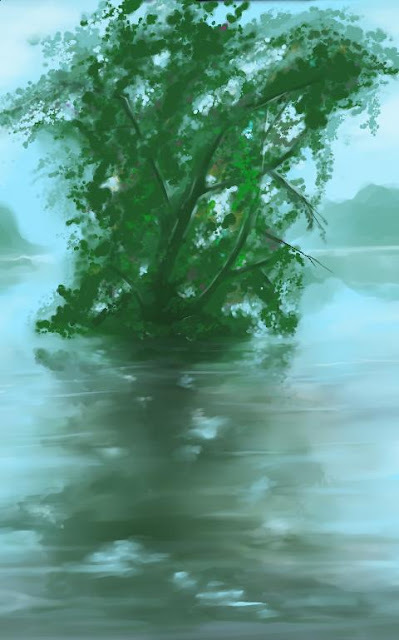 Use the Paint+blur brush to smooth the water now, be careful to retain the shades of dark and light you have so painstakingly added, but make all transitions smooth. This takes some work, so be patient. Darken the water a bit more if you think it is needed. 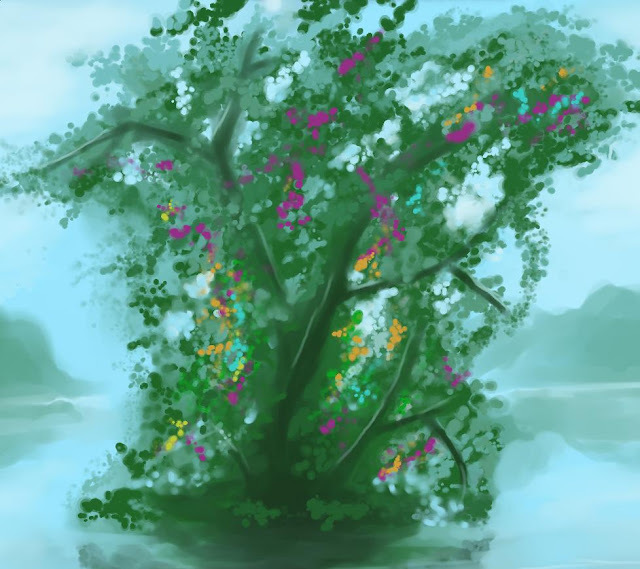 It is time to give the trees more love, by adding proper branches and trunks to them. Do this with dark green and brown. You can play around with which brushes are best suited for this, you want one which tapers off with pressure. Build the tree so that the branches here and there disappear into the greenery. You want to give the impression of 3D -- this is supposed to be a large mass of branches and leaves sprouting in all directions. Make sure to use our leaf-brush for all vegetation -- nature is full of shapes and you don't want to smudge or blur away any detail. Vary the green a lot. As said, nature is full of structure and colour you don't expect. Add spots of "off" colour to your tree. Most of this colour will not be obvious in the final image, but in small quantities colours like this gives more life to the vegetation rather than just sticking with pure shades of green. Make sure you extend the branches with thin lines and details. The drawback of the leaf brush is that it consists of separated dots. You want to go through this and "connect" these leaves so that they don't float freely in the air. Don't be afraid to make complex shapes, trees are complex things. Now add bright spots to the water using the Paint+Blur brush, to reflect where you think the light from the sky would shine through the leaves and show in the water mirror. Here you can see that working with the leaf brush has hid away much of the "off" colours we added, only a few hints remain. Extend your tree-work to the other trees, adding branches and build leaves. On the left above you see an example of a branch extending out over the water, with some highlights on it. Using a small Paint+Blur brush you can add highlights to the water, as well as faint structures on the distant mountains. Start GIMP and load your PNG/ORA image. You can close MyPaint now. We are now in GIMP, and have loaded our mypaint image. If you use ORA, you can continue saving it as such also in gimp, otherwise you should use File->Save as to re-save the image as an XCF image so layers are preserved. 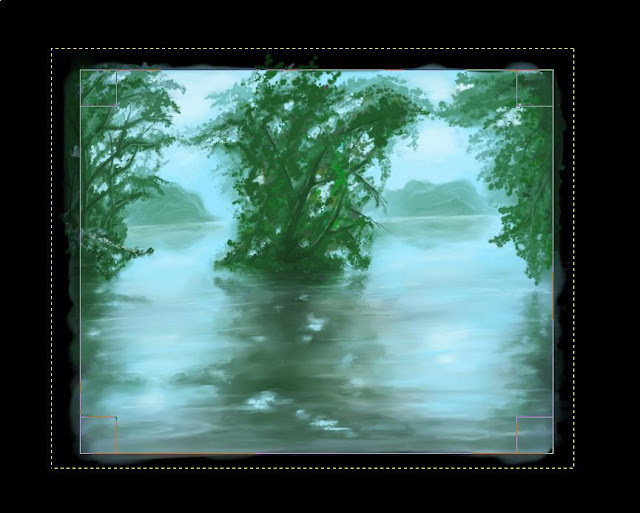 Use the crop tool and cut the image into a nice rectangle, cutting away the excess colour from MyPaint's infinite canvas. I feel the colours of the image are a bit cold. Select Colors->Curves... and raise the curve of the red channel a bit to give the image a warmer feel. We will try to make this into a more nightly scene. 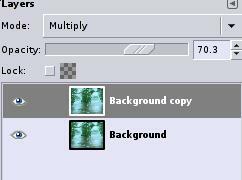 Copy the image layer and set the copied layer to mode "Multiply" with an opacity at 70%. As you can see, our colours suddenly became much more intense and contrasting against the sky. 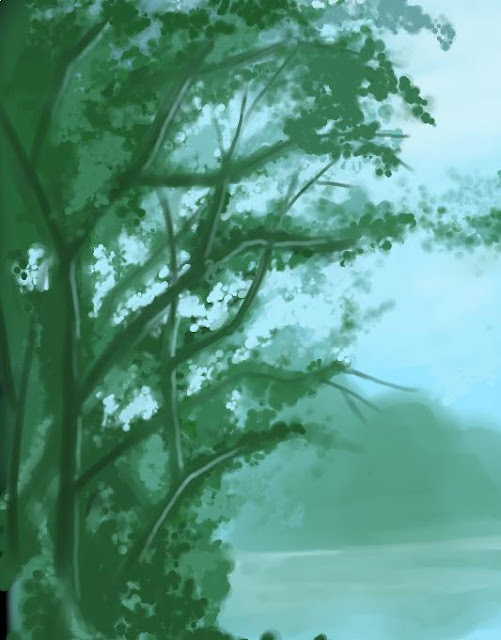 Adding the moody light in the trees (the sun shinging though? A mysterious light among the trees?). 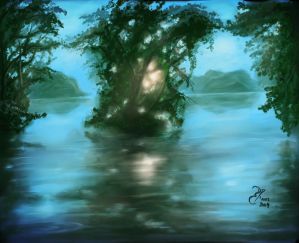 This is done with a large fuzzy brush and the airbrush tool. Make a faint halo of yellow and fill in the center with white. Don't forget the reflection in the water! 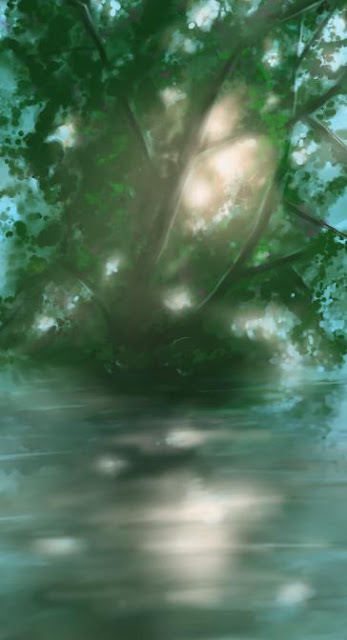 In GIMP it's easiest to work with the smudge tool with a low opacity to smudge the light into the water properly. We will make the edges of the image a little darker. Make a rectangular selection along the top of the image. Make sure you are on your Copied layer (mode Multiply), then select the Gradient tool with a dark blue and a FG->Transparent gradient. Make the gradient vertically across the selection and you will see the sky darkening. Repeat this along all the edges to make them darker and focus the attention to the center of the image. We are done! The final image can be seen on GimpTalk [here] and on DeviantArt [here]. MyPaint implements a different workflow than GIMP, focusing more on painting. Its major advantage lies in prototyping images -- starting to doodle things and see where it goes. Together with GIMP it is very powerful and worth playing around with and learn. It should however remembered that this is only how I work; there are as many ways to do an image as there are paintings. You could for example envision switching between MyPaint and GIMP several times, adjusting the image in steps before continuing to paint. Hope you learned something from this tutorial and that you dare to try this out, it is not so hard as it looks from the length. If so, post your results!